Boating has become more accessible on the Bay, after the Richmond Yacht Club installed an Aqua Creek EZ Lift hoist. 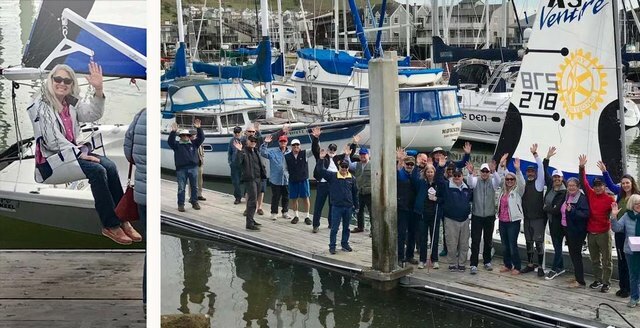 On Saturday, the hoist that assists people with limited mobility into small boats or kayaks was deemed officially open for business, RYC member Shana Bagley said in a statement. During a ribbon-cutting ceremony just before the RYC’s Sail a Small Boat Day festivities, a crowd cheered the new equipment. The best part of the ceremony, said Bagley, was watching Ben, a charismatic blind sailor, sail out with two friends in a RS Venture Connect, an adaptive boat on loan from California Inclusive Sailing. RYC became the third Bay Area yacht club to offer the person hoist. The South Beach Yacht Club/BAADS and Santa Cruz Yacht Club also offer the technology. RYC’s hoist, which is affordable, portable and manual, is “part of a bigger vision to increase accessibility to the water and improve inclusivity in the sailing community,” Bagley said in her statement.